Forget the days of backbreaking work chopping logs, the Logmaster seven-tonne electric log splitter does it for you, enabling you to prepare, dry out and store logs at any time of the year. 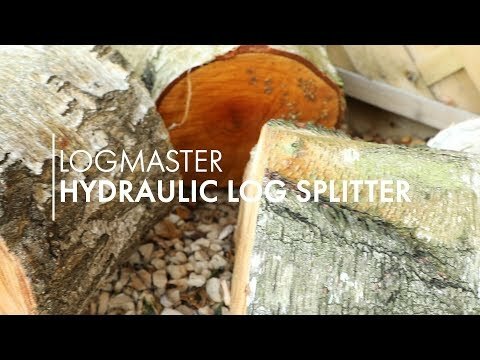 Efficient and labour-saving, it will turn this laborious and dangerous chore into a quick, quiet, easy and automatic task, splitting up to 100 logs per hour. With safe two-handed operation and streamlined, maintenance-free steel construction, it will split all logs including seasoned and green wood, to a maximum log size of 52cm (20.5”) in length and 25cm (10”) diameter, in just seconds. Powered by 230V mains power, it incorporates a self-lubricating hydraulic ram with automatic return, and has a maximum ram pressure force of seven tonnes. This log splitter features wheels for easy manoeuvrability and can be attached to the included stand with ease. It also comes with a log splitter stand which allows you to mount your log and work at a comfortable height whilst splitting wood. Also available is a 15m extension cable, ideal for large gardens, plus a circuit breaker socket for complete peace of mind when working.